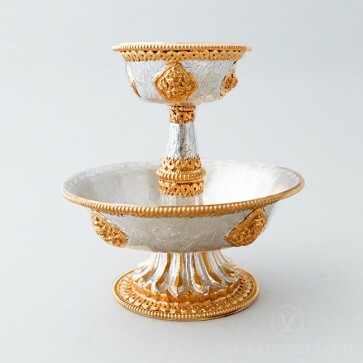 Add this traditional gold and silver-plated serkym set, featuring rich carvings of the Eight Auspicious Signs, to your collection of ritual items to enhance your daily petitions to the Three Jewels. The sacred ritual of Serkym offering pacifies life's problems and challenges through a powerful prayer requesting the Dharma Protector for swift assistance. A traditional gold and silver-plated copper serkym set featuring rich carvings of the Eight Auspicious Signs, hand-crafted by master Himalayan artisans. Add this compact serkym set to your office shrine or home altar to enhance your daily petitions to the Three Jewels.